There’s been several unsavoury incidents recently with supporters getting on football pitches and behaving like idiots. But that’s not to say that every fan who makes their way to the field wants to cause trouble… some just want a cuddle. That was the case with Tottenham’s Christian Eriksen on Thursday evening. Denmark drew 0-0 away to Kosovo, with the Spurs man getting one of the goals. During the match, a Kosovo fan ran on the pitch and went straight for Eriksen. When reaching the footballer, he threw his arms around him for a surprise hug. 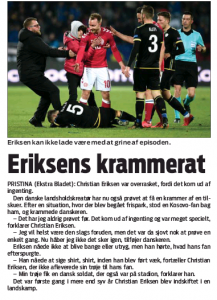 Of course, it’s better than a surprise punch, but Eriksen was still a little taken aback.